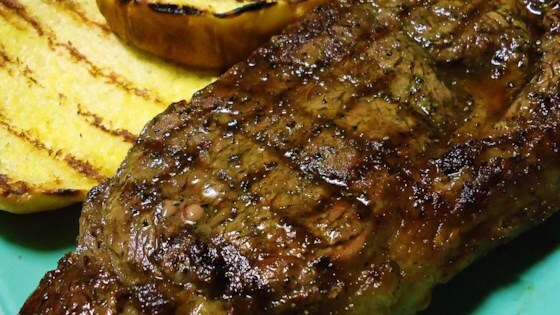 "After eating this style of steak in a restaurant a few times, I worked on making my own marinade. The results are tender and do not have an overbearing bourbon taste. This marinade is very different from the only other one I have seen on this site." Whisk together the water, bourbon whiskey, soy sauce, brown sugar, Worcestershire sauce, and lemon juice in a bowl, and pour into a plastic zipper bag. Add the rib-eye steaks, coat with the marinade, squeeze out excess air, and seal the bag. Marinate in the refrigerator for 8 hours or overnight. Remove the rib-eye steaks from the marinade, and shake off excess. Discard the remaining marinade. Grill the steaks on high, 1 to 2 minutes per side, to sear the meat. Move the steaks to a cooler part of the grill and cook for an additional 2 to 3 minutes per side, if desired. It was a flavorful marinade and if you enjoy bourbon whiskey you will love the flavors. I would use more sugar next time as I like mine more on the sweeter side. VERY good marinade, for any of your steaks. Hint: take the steaks out of the frig to come to room temp (about 30 minutes) before you cook them. AMAZING!!!!!!!! Seriously amazing! I am a LOVER of beef and I truly loved this! The longer you marinade the better.